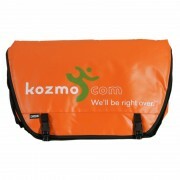 Kozmo.com is coming back and I couldn’t be happier because they’ve owed me $48 for 13 years. If http://t.co/Pkv2RlvuqQ is coming back does that mean I can get that refund for the DVD they claimed I never returned 13 years ago? In the summer of 2000 I lived in a $400/mo SRO in Chelsea. I assure you it was even worse than you’re imagining. I had an internship at CourtTV and was making minimum wage. I got my internet from NetZero, which at the time was one of those brilliant dotcom ideas where you got free dial-up internet in exchange for looking at ads. I had started using the Kozmo.com delivery service while at school that year and it was perfect for my solo lifestyle in New York. I spent a lot of my money renting DVDs online and getting them delivered to my door within the hour. Of course now I can hardly be bothered to go through the effort of putting a disc in my Blu-Ray player when there are so many instant streaming options available, but it was really cool at the time. One night I rented Blue Velvet and watched it on my computer because nobody had stand-alone DVD players back then and I didn’t have a TV anyway. I enjoyed it very much. A day or two later (I don’t remember their rental policies, but it was within the acceptable time frame) I returned the DVD to the drop-off box in a donut shop on 23rd St, where I frequently returned DVDs from Kozmo.com. A few months later a $48 charge from Kozmo.com showed up on my debit card. I checked in with their customer service and they explained that I had never returned the Blue Velvet DVD and so was being charged $48 for the privilege of keeping it. At the time they were having financial trouble, so I figured it was a scheme to stay solvent, but it was an unacceptably large percentage of my net worth so I was unenthusiastic about my part in this scheme. I explained that I did not keep the DVD and that $48 was a bit much for a DVD anyway. They apologized and promised to return the money. Months went by and I was frequently assured that I was going to get that money back. Then in April I learned that they were going bankrupt. Hi there Kozmo people. I guess you’re going out of business, but I thought that before you completely close up shop that maybe you could give me back the $48 you wrongfully charged me. I’ve been trying to get it back since January, and have been promised several times that it would be credited to my credit card and it’s never actually happened. I know you guys have money problems, but I never had anywhere close to $280 million to blow through. Anyway, my username is ********, and I was incorrectly charged for “purchasing” an overdue DVD of Blue Velvet even though I returned it on time. I never got a response and I never got the money, but I bet they have all kinds of cash on hand right now. How about a store credit or something?